Today was a glorious New Jersey day. Temperatures in the 60s, slight breeze, bright and sunny with blue skies and puffy white clouds. We spent so much time outside soaking it in. We chalked, we pulled out the bounce house, we used the swings, and we blew the biggest bubbles ever! Such a great day with my girl. All this sun and fun had us itching for summer. And summer means swim suits. Here are some adorable ones. We already have the Gymboree on order! Mostly because I wish these came in my size! For those who don’t know, green is my signature color. I love it. I even incorporated it into my wedding. 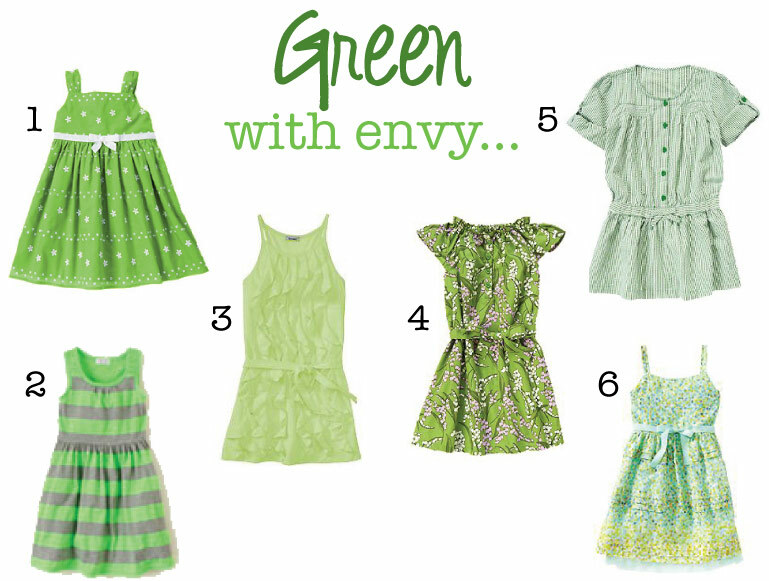 No wonder that I’m loving these rocking green girls dresses. My daughter now is the proud owner of something from each previous post, and the tough choice of which one of these will end up in her closet has begun. What looks are you most excited about for spring and summer? Or are you just looking forward to ditching the long sleeves, puffy coat and boots? I love being able to walk out the front door without taking 10 minutes to prep myself and mini me first. It’s been cold, and windy as all get out, here in New Jersey, but I’m sure the nice weather will be here soon. And in another few months, when it’s 60 degrees hotter outside we’ll be complaining about that! Enjoy my green with envy choices!